Elephant seals duke it out playfully near California Highway 1. Since leaving Massachusetts on April 11th, I’ve soaked in some spectacular scenery. The natural creation of Grand Canyon, Glen Canyon, Bryce Canyon. The manmade equivalent in the form of Vegas and Hollywood Boulevard at night. Scores of scenes of quieter beauty, from dawn on the Texas Gulf Coast to twilight in Santa Barbara. Almost enough to say, OK, enough with the whole panoramic vista thing. So last week when my friends Ted and Chella proposed we run a two-car tag team up the curves and dips of California Highway 1, from San Luis Obispo to the Monterey Peninsula, I started building in escape clauses. I’d give Chella a ride as far north as Pismo Beach, and then, well, we’d see. 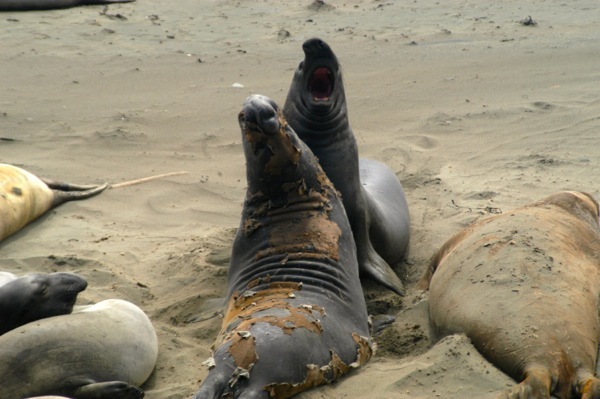 But who can resist the Elephant Seal beach – where one can see hundreds of elephant seals, which can get up to two tons, lying side by side next to the surf – or Ragged Point, a high cliff jutting sharply out into the Pacific. Or the way visibility can change from metallic blues and bright green in bright sun to the waves gone dark in a sudden incoming fog. At points you’re level with a thin layer of cloud, splitting the ocean from the sky. Redwoods, pine, and spruce abound. This is scenery you can gladly give your heart to – and the kind of twisty-turny cliff-side driving that you sure as hell better give your mind to. All of which should pretty much be enough to make you forget about your day job, or your research project, or almost any human endeavor. Yet even on our Wednesday drive up this profoundly moving coast, on a day when I had no ambitions other than absorbing natural beauty, the theme of service has a way of poking its head up like a sea lion eying a rock to climb onto. Near the elephant seals, amid a sudden fog, a woman talked loudly over a blasting wind, fielding questions. 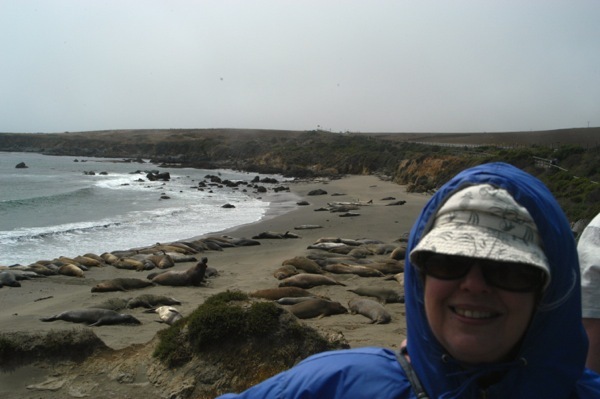 The seal on her jacket identified Charmaine Coimbra as one of the Friends of the Elephant Seals. Charmaine and her friends amid a blustery wind. Even though I’ve visited this stretch before, Charmaine’s expertise gives me a new appreciation for what’s happening in front of me – which, as far as I can tell, is mostly nothing. Sure, they flap about a bit, and two young bulls rise up and play-fight, emitting a few deep howls in the process. Mostly they just lie there. But their stillness gives you the chance to observe the various stages of molting, the loss of the brown furry outer layer for the smooth silver-grey skin beneath. This is what they swim down from Alaska to do for a month every summer. There’s also something else going on. During their long swim, they lose bone density; the prolonged time on land, even just lying and moving sporadically, gives them the chance to rebuild their skeletal support. Paradoxically, this healthy instinct comes at the expense of exercise – so they also fast. They thus adjust diet for their exercise level – which is one way that a two-ton elephant seal has healthier habits than this (weight fortunately not available at press time) human. Charmaine didn’t wait until retirement to start volunteering – her career in community service began at age 3, when she accompanied her father in dancing to “Me and My Shadow” at a Grange fundraiser. She’s been involved in various forms of volunteer work in the decades since. 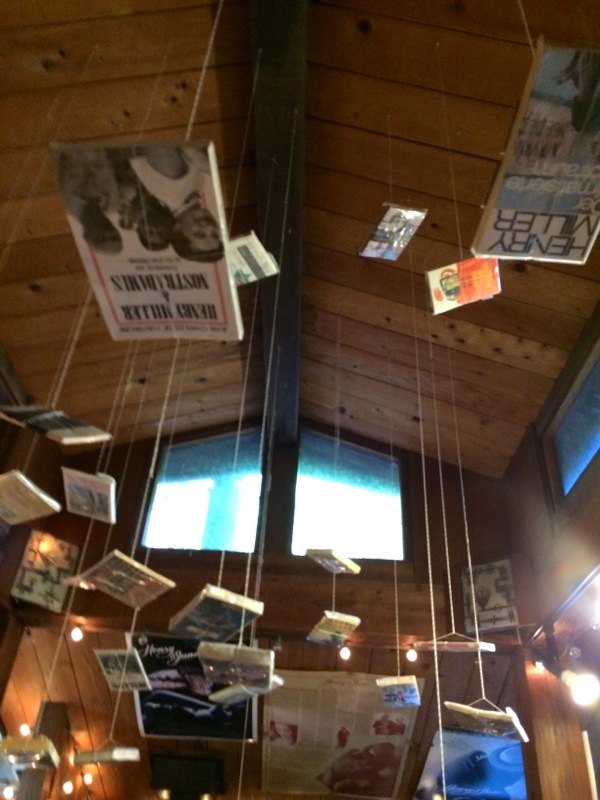 Books hanging from Henry Miller Library ceiling. Further up the road, past Ragged Point and other locales, I catch up with Ted and Chella once again – at the Henry Miller Library, a wonderfully quirky roadside tribute to the famous bohemian fiction writer. I enter a courtyard couched under towering redwoods and other trees, wind myself past modern folk art sculptures, some seeming to celebrate fertility and eroticism, others suggesting crucifixion and the evil of television. The A-frame library is marked by Henry Miller books hanging open from the ceiling, sunlight shining through from above. Out back, I find a deck and plush couches. On one of them sits my friends – on the other a young woman with blonde-and-pink hair, curled up. The book she’s reading isn’t by Henry Miller – it’s a Harold Robbins instead. 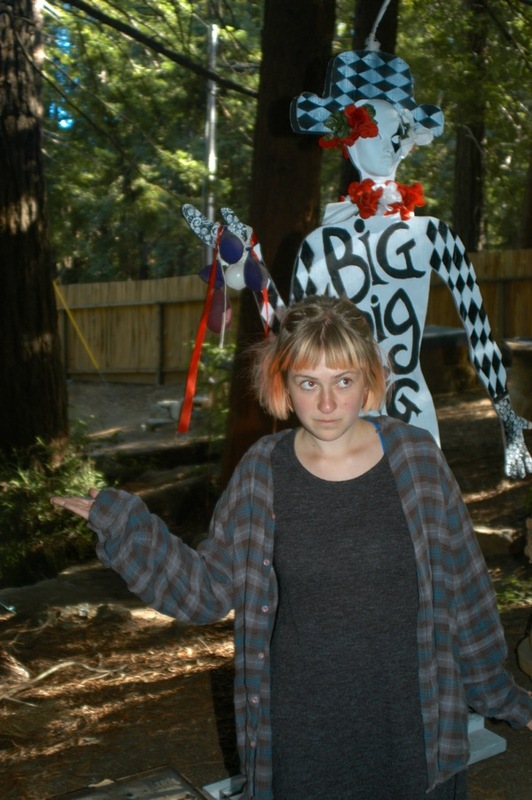 But Anna Leah is an English major back east in Boston, and when she was looking for a way to volunteer in the Big Sur area, site of many family vacations, it was hard to resist the library. She gets to pitch her tent behind a wood fence not far from the couch, and uses a solar shower. She cleans before and after each business day, as well as working in the shop. Anna Leah mimics one of the statues. 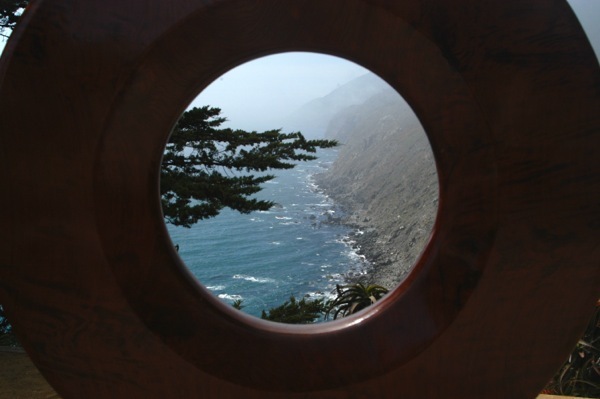 A ringside view from Ragged Point.